NATHAN CASSIDY: WATCH ME. LOVE THIS. ITS DEEP. 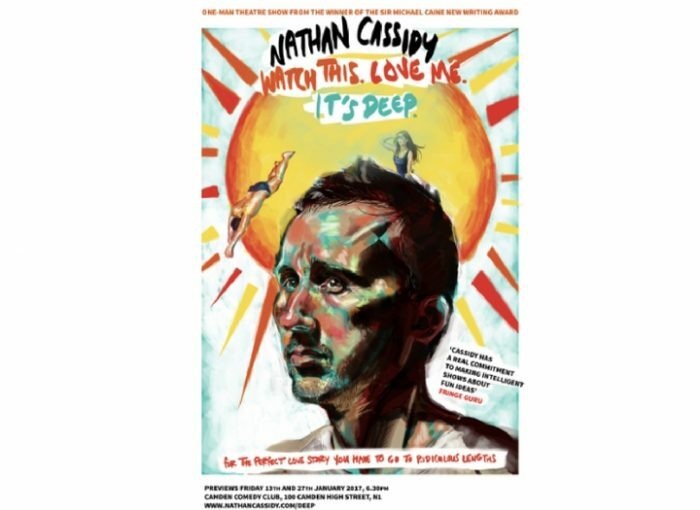 Award-winning writer and comedian Nathan Cassidy’s new one-man theatre show. A perfect love story in a swimming pool. It’s deep. For the perfect love story, you have to go to ridiculous lengths. This theatre show combines Nathan Cassidy’s award winning comedy with a real life love story. At 15 years old, Nathan met the love of his life in a swimming pool, and it became a perfect love. This is their story. Nathan’s last play ‘The Cure for the common cold’ won the Sir Michael Caine Award for new writing in theatre. As a stand-up he has won and been nominated for awards including a Malcolm Hardee Award nomination at the Edinburgh Fringe and best show win on the Buxton Fringe 2014 (and nominations for the last 2 years).